President to address National Assembly at today. 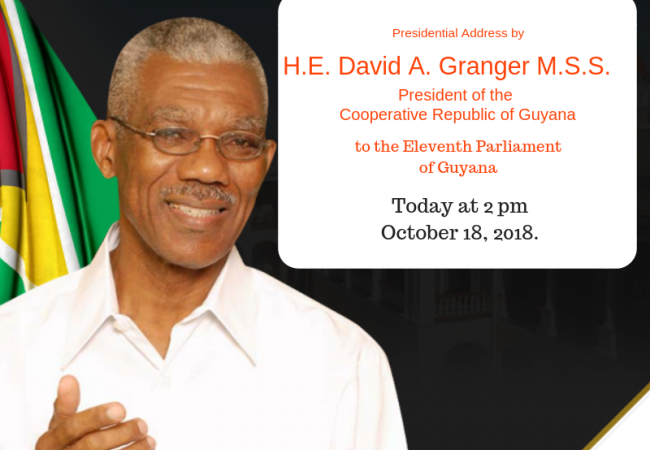 The business of the 97th Sitting of the National Assembly of the Eleventh Parliament of the Cooperative Republic of Guyana will be suspended to enable the Speaker to receive His Excellency, the President, David A. Granger M.S.S. who will be addressing the National Assembly. The Business of the 97th Sitting of the National Assembly will resume after his Excellency’s address. The Sitting will be held at 2 pm in the Parliament Chamber of the Public Buildings, Brickdam, Georgetown, Guyana.